Even in warm Las Vegas, our homes need heat in the winter. But furnaces fill your home not only with warmth but also with dry winter air. The absence of moisture can aggravate asthma, dust allergies, and even cause nosebleeds for some people. Most people notice their skin, hands, and scalp getting dry in the winter. Even worse, for some people, sore throats and “perpetual colds” linger for weeks. Humidifiers help ease nasal and chest congestion. The systems can be as simple as a perpetual pot of boiling water in the kitchen, a tabletop mister or an entire system attached to your home furnace. However, when not cleaned properly, all types can lead to health complications. Poorly maintained humidifiers can encourage the growth of mold and mildew, according to the Mayo Clinic. This device that can be installed on a new or existing furnace. There are a number of different kinds of humidifiers, including drum, disc wheel, flow-through, and spray mist. For example, evaporative humidifiers use a reservoir, porous wick, and fan to put moisture in the existing vent system in your home. The wick absorbs water from the reservoir, and the fan then aids in evaporation by blowing on the wick. As a result, all of the air in your home contains more moisture, which raises humidity levels and keeps you and your family warm and healthy. What’s the Right Humidity Level For A Home? Not only do our bodies hate overly dry air, but our homes also do. Wood floors and furniture need a minimum humidity level of 35% to prevent splitting along the grain. Our bodies love more humidity – but if it gets over 35% you run the risk of mold growth. MayoClinic.com recommends keeping humidity levels between 30 and 50 percent, over 55% can help germs thrive. Measure the humidity in the home using a hygrometer, purchased at a local hardware store. The trick to controlling mold is controlling excess moisture. 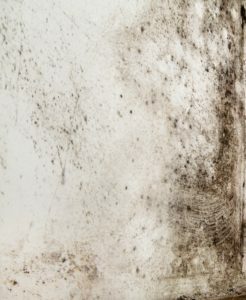 Mold spores are everywhere and only need two things to grow: water and oxygen. Furnace humidifiers do not cause mold but when set much too high, they create the conditions needed to help mold take over. Again, keep your humidifier set to 45% and check with a hygrometer. Ensure your bathroom has a ventilation fan that works. The humidity from an entire family taking long hot showers can help contribute to mold growth in the bathroom. If you cook a lot using boiling water, you may want to turn your humidifier off for a while, and ensure you have a range hood that vents to the outdoors. Front loading washing machines can develop mold if they’re not cleaned out periodically. Use distilled or demineralized water and change the water often; avoid letting water sit in the tank. Keep the area around the humidifier dry– this space can encourage mold and bacterial growth. Change the filter in your central air conditioning and heating system regularly. Your humidifier is circulating more water in the existing air in your home, so keep your entire air system as clean as possible. When the humidifier is in heavy use during the winter, or when a family member has a cold, clean it weekly with a simple vinegar or hydrogen peroxide rinse. Do a deep monthly clean of the tank, base, and filter (or per your manufacturer’s instructions). Replace the humidifier when necessary. Old humidifiers may start to break down over time. The worn-out parts will be more prone to hosting bacterial growth. Humidifiers can build up difficult mineral deposits, which are impossible to remove and encourage bacterial growth. Before putting your humidifier in storage, clean it thoroughly. Throw away any temporary parts (such as used filters or water cartridges) and make sure it is completely dry. Order any new filters or cartridges you’ll need when you use it again and store them with the humidifier. For bigger systems and bigger problems, call ERX Emergency Restoration. ERX experts can help with any mold problems- whether from a flood, water damage or a humidifier. The team will get to work with the latest technology to decrease drying time, reduce damage and get your life back to normal.